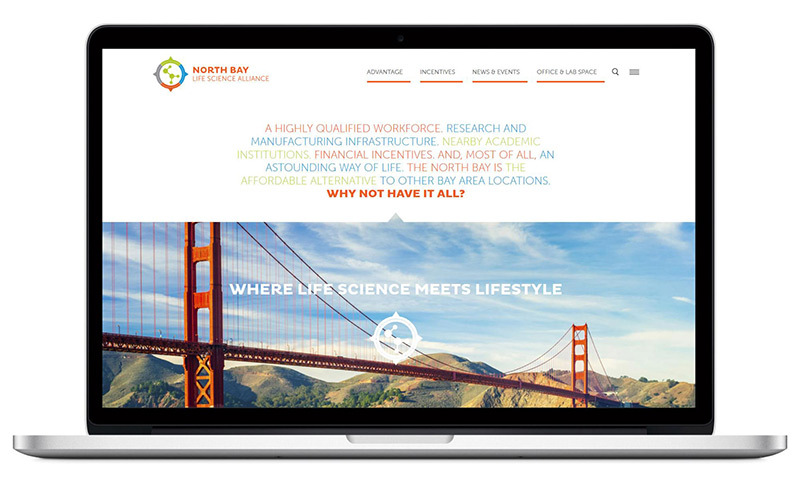 Kiosk recently completed a redesign and relaunch for the website of the North Bay Life Science Alliance (NBLSA), a cross-disciplinary organization of life science professionals, educators and public leaders, dedicated to growing the life science industries in the North Bay. The four counties that make up the North Bay are already home to internationally renowned organizations like The Buck Institute for Research on Aging, the nation’s first independent research facility focused solely on understanding the connection between aging and chronic disease, Genentech, who have one of the world’s largest biotechnology manufacturing plants in Vacaville, and BioMarin, a pharmaceutical company currently expanding their facilities in San Rafael. Kiosk was able to highlight some of the fastest-growing life sciences companies in the North Bay, along with many of the developmental agency personnel, local and state-level government representatives and other individuals who are working to create a welcoming environment for life science startups and companies looking to relocate. This represents a major revamp of the NBLSA website and their website marketing, which adds a considerable amount of content and context to the organization’s mission. As a company headquartered in the North Bay, Kiosk is excited to help tell the stories of other successful North Bay businesses, and the people who help promote growth in our communities. We look forward to continuing our partnership with the North Bay Life Science Alliance as they promote this significant economic initiative for the region.